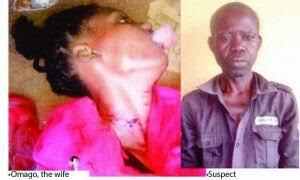 Welcome to Mercy Ebute's Blog: Photos: Depressed man kills wife and daughter because he couldn't cater for them. Photos: Depressed man kills wife and daughter because he couldn't cater for them. The Police in Abuja have arrested 40-year-old Dominic Iyayi Ogar, a native of Okpoma village in Yala Local Government Area, Cross River State, over the gruesome murder of his 27 year old wife, Omago and their two year old daughter, Blessing, at their home in Mpape, Abuja on October 8th. Sunday Sun reports that Ogar on the day of the incident, slept on the same bed with his wife and daughter and in the middle of the night, took a knife and stabbed both of them to death. According to the FCT Commissioner of Police, Mohammed Mustafa, Ogar after carrying out the dastard act, carried the corpses of his wife and daughter to a nearby nursery and primary school in the area where he left them there after writing a little note and dropped it beside the corpses. He then ran off to hide in his farm. 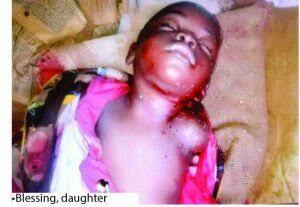 One of his neighbours, Destiny Onwusuaka, woke up the next morning to see trails of blood from the Ogar's apartment. Meanwhile corpses of the deceased have been deposited at mortuary of the National Hospital, Abuja.